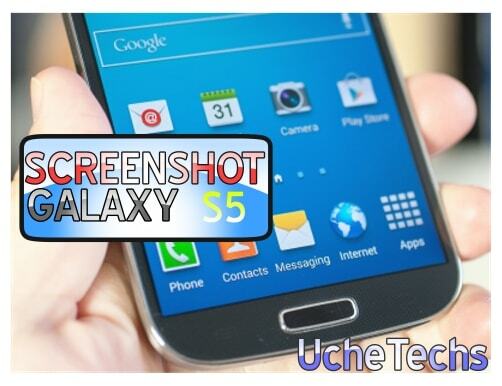 There are applications and some other tips online to Screenshot on Samsung Galaxy S5 phone. But time matters and for this reason, I have provided an easier and a fast method to take a screenshot on Galaxy S5. Samsung Galaxy S5 might be an old device, but that doesn't mean it doesn't undergo updates and that it features are outdated. Screenshoting your phone screen can be very important. For example, you might have come across a picture on Facebook or online which you will like to download or an important text online which can't be downloaded, you might want to consider screenshots. Samsung Galaxy S5 has an inbuilt setting to screenshot your screen by swiping your hand across the screen and also another a manual method by holding some buttons on your Phone. So if your Samsung Galaxy S5 Screenshot is not working, then you should rest assured that this method below will be the final solution to the problem. Now, you'll hear a Sound like a camera taking pictures and a white flashlight around the screen. This is method 1 to screenshot on Samsung Galaxy S5 Phone. This method might not be used by some readers because it's a bit stressful and the buttons can start getting a bit subdued, so i'll recommend this method below. Note that this Method 1 to Screenshot on Galaxy S5 works on 90% of Android devices so you can try this on your Android phone. The above GIF will be of great help to you. That's how you should neatly swipe your palm to screenshot on Galaxy S5. Also, before this can work on your Samsung Phone, you need to enable the inbuilt Palm Swipe to capture feature. Scroll down to "Motion" and choose "Motions and gestures." Tap "Palm swipe to capture." Hit the toggle button from on to off. That's it, a very easy Android tip. Ones you screenshot on your Galaxy S5, you can easily locate and share it with friends. Check out this cool Android tip to make your Android phone battery last longer.